The Bee Hummingbird (Mellisuga helenae) is endemic to Cuba, meaning it lives mostly in Cuba and a few surrounding islands (FactZoo). This particular hummingbird weighs approximately 1.6 grams and is comparable in mass to the Bumblebee bat of Thailand, making the M. helenae the smallest bird in the world (Smith, Lyons, Eds.). feathers. The female on the other hand is slightly larger than the male and has green upperparts, tail feathers with white tips, no iridescent plumage (Wildscreen Arkive), and a turquoise-blue or white underbelly (Neotropical Birds Online). They both have a straight dull black bill (HBW Alive). 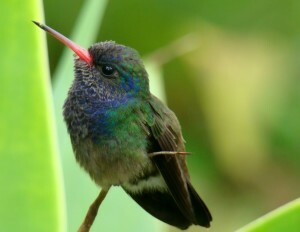 The Bee Hummingbird can be found in various areas around Cuba including Habana, Sierra de Anafe, Guanahacabibes Peninsula, Zapata Swamp, and possibly in the Isla de la Juventud (BirdLife International); although there have been reports that are still being debated that the Bee Hummingbird has gone extinct on that island (Avian Web Beauty of Birds). They mostly inhabit dense coastal forests and forest edges with large amounts of bushes, but may also be found in swamplands, mountain valleys, interior forests, and gardens (Avian Web Beauty of Birds). They live mostly in lowlands, but can survive at low or high elevations. M. helenae lives Cuba because of the subtropical climate with no intense dips or spikes in weather patterns, and because Cuba has seen relatively little deforestation (Animal Diversity Web). 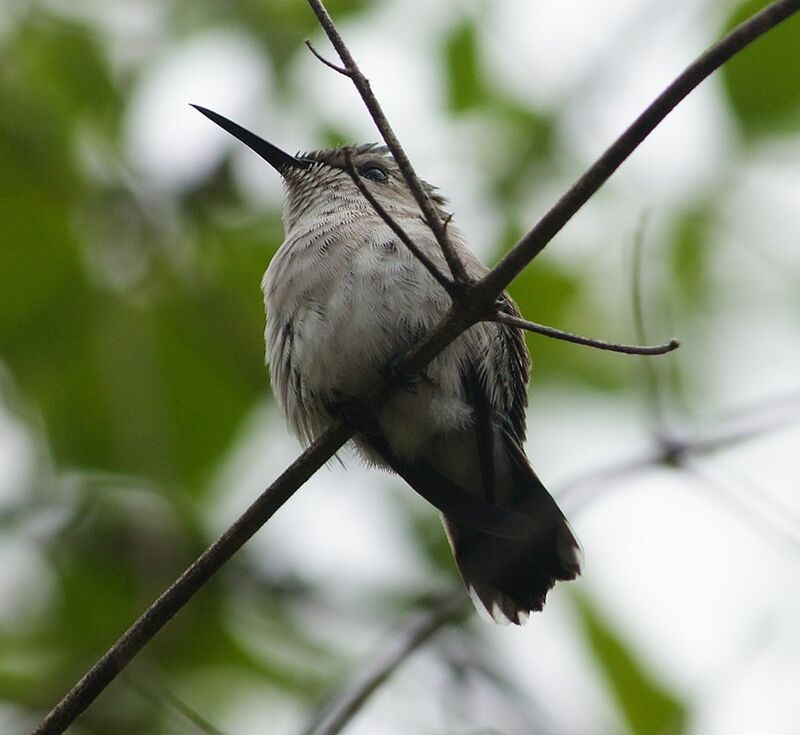 Despite the slow rate of deforestation in Cuba the Bee Hummingbirds population is declining and habitat loss is acknowledged as the main cause (HBW Alive). The population has declined so much in fact that the IUCN has raised the Bee Hummingbird to “near threatened” from its previous level of “least concerned” (FactZoo). Besides habitat loss these hummingbirds are also being threatened by various predators like the introduced mongoose, and rats (Wildscreen Arkive) along with bees and wasps, spiders, frogs who take the Bee Hummingbird as prey as easily as they would an insect. Praying mantises also consume Bee Humingbirds and have been observed to wait on the tops of flowers previously visited by the tiny nectar feeding birds in order to take them as prey (The Hummingbird Society). The Bee Hummingbird on average eats half of its body weight in food every day (Wildscreen Arkive), which equates to approximately 4 percent of its own body mass being consumed every hour for 12 hours straight (Tennekes). It also consumes more than eight times its mass in water (Wildscreen Arkive). 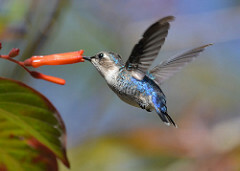 This hummingbird eats insects for protein and drink sugar rich flower nectar for energy (Stefoff). The Bee Hummingbird visits so many flowers per day to satisfy its thirst that it is capable of pollinating 1,500 flowers in a single day (FactZoo). The favored source of nectar for this bird is from the large ornamental flowers of the Solandra grandiflora vine (Avian Web Beauty of Birds). Although this is their favorite flower the Bee Hummingbird has been shown to feed from a variety flowers that have a 15 – 30% sucrose concentration (Avian Web Beauty of Birds). A few flowers with this concentration would be the Malvaceae, the Apocynaceae, the Chrysobalanaceae, and approximately seven others. Besides sucrose concentration these flowers share other traits that appear to be preferable to the M. helenae. For instance the flowers it frequents are typically odorless, have a long narrow orange-red corolla, in additon to matching the dietary needs of the Bee Hummingbird (Dalsgaard, Bo, et al.). One other factor that these flowers all share is that they typically have nowhere for this hummingbird to perch, forcing it to hover while it feeds (Miller). The M. helenae has a breeding season spanning from March to June (Wildscreen Arkive), which is also the flowering pattern of the Solandra grandiflora (Animal Diversity Web). During this mating season the male will wait for a female to enter his courtship territory and will then create a song by ascending 5-40 meters, diving past the female perched on a branch and quickly fanning out his tail feathers and shutting them. The volume of this song is determined by the speed of the wind flowing through the males tail feathers (Clark, Elias, and Prum). If they are not creating a song this way then the males will form a group called a Lek, and will sing vocally to attract a female. While their song attracts female Bee Hummingbirds the song is high pitched and quite variable from male to male. It is also relatively unattractive to the human ear (Animal Diversity Web). During a courtship display the Bee Hummingbird increases its wing beats from eighty per second to two hundred per second (Wildscreen Arkive). If these courtship displays are successful the M. helenae will mate and the female will build a nest and care for the eggs by herself. The nests are built out of lichen and moss to give a bit of camouflage (wildbirdsonline), along with bark and spider webs (FactZoo). The females build the walls of the nest by pressing against the materials with their bodies and their beaks and compact the bases of the nests by jumping up and down on it (wildbirdsonline). After the nest is built the female lays two eggs which are incubated for around 22 days (Wildscreen Arkive). The eggs weigh approximately 0.8 grams. The female uses a brood patch (a bare patch of skin on her abdomen) to make contact with the eggs and transfer her body warmth to them. If the female allows the eggs to cool then they could face longer incubation periods, or birth defects including death (Mueller, Burggren, and Tazawa). During this incubation period the female can leave the nest anywhere from 10 to 110 times a day, but the eggs are always covered from direct light for anywhere between 60 to 80 percent of the day (wildbirdsonline). Eventually the eggs hatch and when they do the chicks are born blind and nearly featherless, but they rapidly mature. These chicks are not fully mature for around 22 to 24 days and are fed by the mother for 20 to 40 days (Animal Diversity Web). During those 20 to 40 days the chicks are fed on average 1.2 to 3 times an hour. Whenever they are ready the mature chicks will leave the nest without any “push” from the mother (wildbirdsonline). The Bee Hummingbird has the highest metabolic rate relative to body mass of any animal on the planet (Ketz-Riley and Sanchez). In fact with size taken into account the Bee Hummingbird burns around 10 times the energy of a marathon runners every single day (Animal Diversity Web). The Bee Hummingbird uses so much energy that its biology and diet has evolved to suit this massive metabolism by developing an intestinal tract which is able to absorb 99 percent of all glucose ingested within 15 minutes. It also has one of the most metabolically active livers with the highest level of enzymes for producing lipids, and an enlarged hippocampus capable of remembering specific locations and distributions of high nectar yield flowers. Also, its respiratory tract is capable of supporting 250 to 400 breaths per minute (Ketz-Riley and Sanchez). In addition it also has a heart that can beat upwards of 615 times a minute which assists the efficiency of its rapid breathing (Stefoff). Although the M. helenae’s metabolism rate is so great it attempts to keep it lower by using torpor ( an inactive state in which the internal body temperature is lowered to match the temperature of the surrounding air) during the night (Animal Diversity Web). This equilibration of body temperature to environmental temperature lowers metabolism due to the fact that a animal’s metabolic rate can be expressed in the equation “rate of metabolism = internal body temperature minus the temperature of the surrounding environment” along with the affected surface area of its body (McNab). Arguably the bee hummingbird’s most important feature is its wings which have a shoulder joint giving them the ability to swivel allowing for flight in nearly every direction (Stefoff). The wings can move directly up, down, backwards, or even upside down for short periods of time. The Bee Humingbird is also capable reaching speeds of 25 to 30 miles per hour (Animal Diversity Web). The other reason that these birds are able to fly in so many different directions is because their wings have a low aspect ratio are given a 3 to 4 ranking out of 10, meaning they are short and thick. Not only does this allow them to fly in any direction they want without stalling like an airplane might, but it also allows them to fly at any speed or even to hover (Stanford Report). Along with their shoulder joints their small size is also an adaptation which gives them increased maneuverability and a large “mass specific power”, which is determined by muscle force output and muscle contraction frequency (Dial). This combined with the fact that their specialized wing muscles take up 22 to 34 percent of their total mass makes M. helenae a very powerful flier (Animal Diversity Web). Clark, Christopher J., Damian O. Elias, and Richard O. Prum. “Aeroelastic flutter produces hummingbird feather songs.” Science 333.6048 (2011): 1430-1433. Google Scholar. Web. Dalsgaard, Bo, et al. “Floral traits of plants visited by the bee hummingbird (Mellisuga helenae).” Ornitologia Neotropical 23.1 (2012): 143-149. Google Scholar. Web. Dial, Kenneth P. “Evolution of Avian Locomotion: Correlates of Flight Style, Locomotor Modules, Nesting, Biology, Body Size, Development, and the Origin of Flapping Flight.” The Auk (2003): 941-952. Google Scholar. Web. Ketz-Riley, Cornelia J., and Carlos R. Sanchez. “Trochiliformes (Hummingbirds).” Fowler’s Zoo and Wild Animal Medicine 8 (2014): 209-213. Google Scholar. Web. McNab, Brian K. “Extreme Measures : The Ecological Energetics of Birds and Mammals.” University of Chicago Press (2012): 1-24. Google Scholar. Web. Miller, Richard S. “Why Hummingbirds Hover.” The Auk vol. 102 (1985): 722-726. Google. Web. Smith, Felisa A., and S. Kathleen Lyons, eds. “Animal body size: linking pattern and process across space, time, and taxonomic group.” University of Chicago Press (2013): 187-193. Google Scholar. Web. Stefoff, Rebecca. “The Bird Class.” Marshall Cavendish (2007): 52-53. Google Scholar. Web. Tennekes, Hendrik. “The simple science of flight: from insects to jumbo jets.” MIT press (2009): 1-34. Google Scholar. Web. Bee Hummingbird – Smallest Bird in the World. FactZoo. 2015. Web. 25 September 2015. 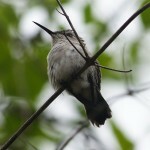 Bee Hummingbird (Mellisuga helenae). HBW Alive. 2014. Web. 25 September 2015. Bee Hummingbird (Mellisuga helenae). Neotropical Birds Online. 2010. Web. 25 September 2015. Bee hummingbird (Mellisuga helenae). Wildscreen Arkive. N.d. Web. 25 September 2015. Bee Hummingbird Mellisuga helenae. BirdLife International. 2015. Web. 25 September 2015. Bee Hummingbirds: The Smallest Living Birds. Avian Web Beauty of Birds. 2011. Web. 25 September 2015. Hummingbird Predators. The Hummingbird Society. N.d. Web. 25 September 2015. Mellisuga helenae bee hummingbird. Animal Diversity Web. 2002. Web. 25 September 2015. 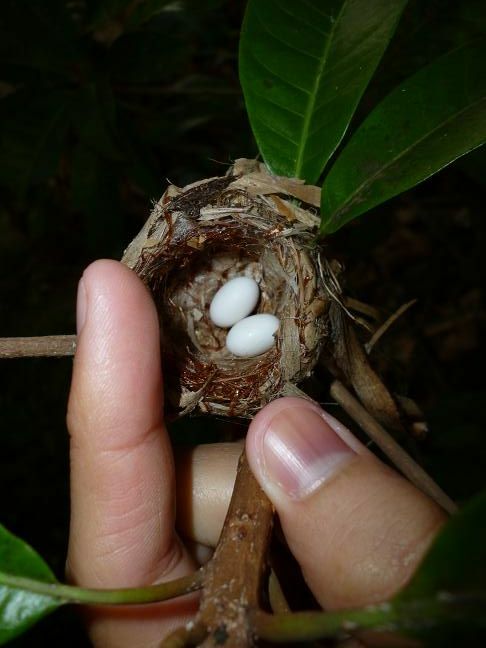 Nesting Behavior of Hummingbirds. wildbirdsonline. N.d. Web. 25 September 2015. Stanford engineer helps crack mystery of bird flight. Stanford Report. 2015. Web. 29 September 2015. Wikimedia Commons. Wikimedia Project. Web. 25 September, 2015. Flickr. Yahoo. 2012. Web. 25 September, 2015.